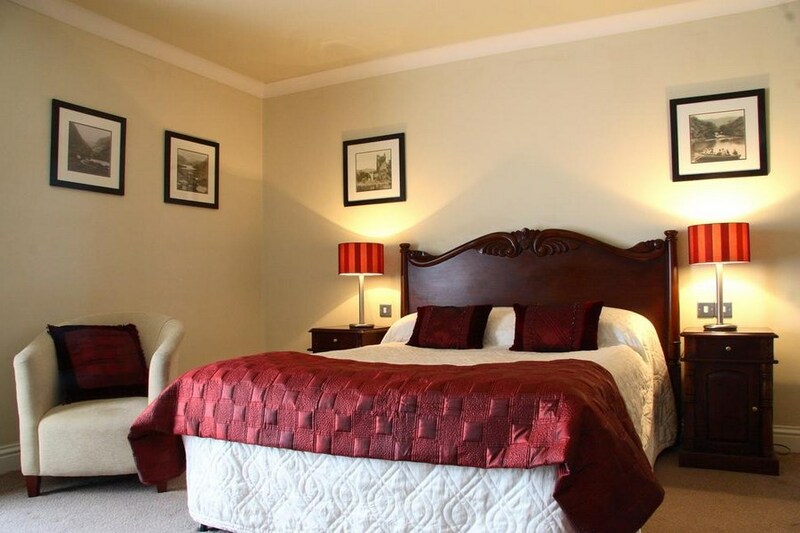 Just outside Killarney town, overlooking the Flesk River against the backdrop of MacGillycuddy Reeks, the Riverside Hotel offers spacious comfortable bedrooms in plush surroundings. We stayed here over the Christmas period recently and were very happy with the hotel and would definitely stay again. When we arrived in our room I was disappointed as the bed was a double and as I find it difficult to sleep I went to reception to enquirer if it was possible to get a room with a bigger bed. The lady on the reception desk could not have been more helpful and a room with a super king size bed became available immediately without any extra cost! And what a comfy bed it was; great nights sleep. Staff are lovely and friendly. Looking forward to returning. Hotel was clean, bed wasn't a bit conformable, and o my god the food in the restaurant was not nice. 4 of us eat in the restaurant and none of us liked the food!!!!!! Bon rapport qualité prix, très bien situé, proche du centre ville sans les nuisances. Despite a request on Booking for a disability room and cot in 2nd room, these were not provided. When I pointed out to the Receptionist on duty about the disability room, her answer was all the rooms are disability access with wide doors and low baths. I'm sorry but this is not accepted standard for a disability access. You need proper walk in showers to take wheelchair/rollators plus proper hand rails to classify a disability bathroom. Hotel please take note. We decided not to pursue with the cot as the room given was quite small to take one. Also, there seemed to be a problem with supplying a top-up toilet roll. in our room. Duvets on beds were quite heavy and rooms very warm despite turning off radiator at wall. The one evening meal included in our stay was awful. Dried overcooked salmon plus steak which was well overdone. Also choice on menu was poor with extra charge supplement required on most main courses. Overall, the hotel foyer was lovely and we encountered one Waitress in the Restaurant who was exceptional. Maria Colgan. Really enjoyed our nights stay. The hotel was nice and comfortable and the staff were very friendly. Four of us stayed and the only drawback that we found was that the menu for the evening meal didn't have much choice and the food that we did get wasn't great. (none of the four of us are fussy!!!!). Breakfast was nice in the morning though. 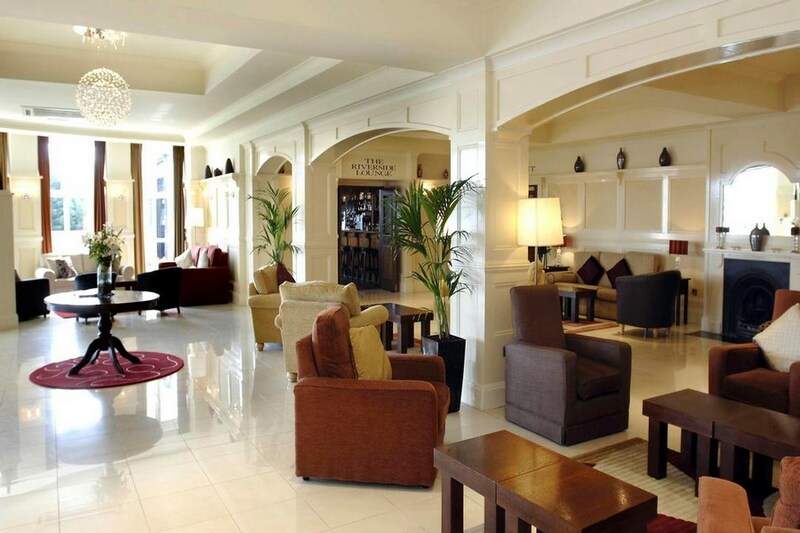 Lovely hotel and in a great spot, just a 10 minute walk from the Killarney town. Always a nice place to stay. Frequent visitor to Killarney and you can't beat it for comfort, value and location. We had a lovely stay. Room was spacious and clean. Staff were friendly and helpful and the lobby area was really cosy with an open fire. It is just outside Killarney town. But we walked in and it only took ten minutes. Breakfast was excellent and cooked to order. We would definitely return. Lovely hotel we got a warm welcome, The food was lovely staff very helpful.Would stay there again. a very welcoming hotel, rooms spacious and clean , food excellent. decor relaxing seating in restaurant a little dated. Staff friendly and helpful, breakfast very good. Will stay here again. 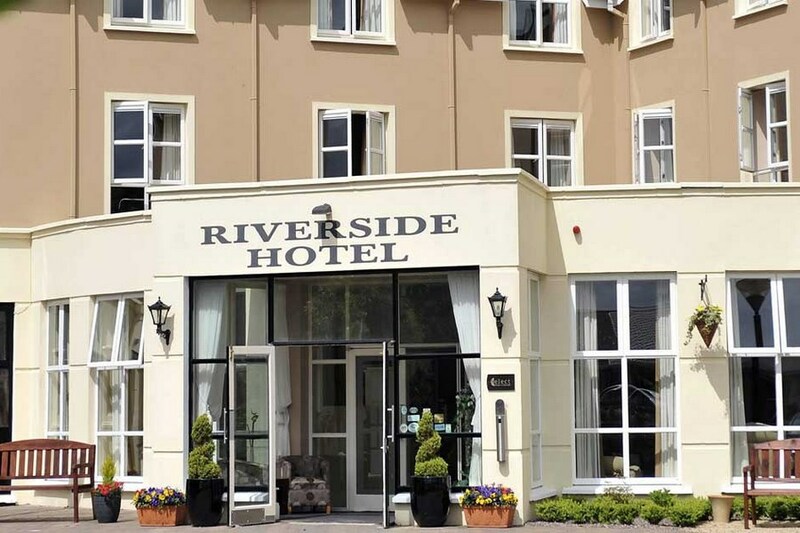 We enjoyed a recent trip to the Riverside Hotel, staff were extremely friendly, courteous and efficient. Our room was nice, clean and bright and had all the accessories required for a short stay. We enjoyed a delicious breakfast and really liked their healthy options. The dinner menu was quite limited especially on our first evening and when I requested the fish to be pan-fried instead of deep-fried in batter, the chef declined my request, which was a pity as I had to change to another choice. I was disappointed as it takes only a few minutes to pan-fry a piece of cod! Overall we enjoyed our stay and would return as it is very conveniently situated. Another point I would like to make is that the reception staff request full payment on arrival, it is the only hotel known to us that make this request, when I mentioned it to them, they said it was to ease queue at check-out but we saw none during our stay. We checked out at 11.30am and we were alone with no queue in sight!!!! Nice Hotel, good location. Breakfast buffet and Full Irish served to table is a lovely treat. Restaurant could be a bit more inviting for dinner. Menu for dinner a bit limited but food was ok. Over all a good value for money break. Everything was great except for the tour groups booked in for the 4 nights of our stay. We were not able to choose our meal times as the toursgot priority. Had to wait 40 mins for our hot breakfast on the last morning, as the staff were giving the tour priority. We are regulars and felt let down even though it is the likes of us who kept the hotel going through the hard times. This is a good hotel and the rooms are spacious and comfortable. Breakfast was excellent and dinner was fine. The dining room is a little dark and I did not understand why the curtains were closed on a lovely summer evening. We were handed the inclusive dinner menu only and the main course choices were a little limited. Staff were excellent and service too. I was disappointed to find the pictures of seating beside the river were actually taken in the public park next door and not in the hotel grounds, which consists of car parking only. We enjoyed our stay and had a lovely time. We enjoyed our stay there. It lives up to it's 4* rating. i would definitely stay there again. Just at the right distance to the town too. Comfortable hotel and very helpful and friendly staff. Food good but could do with more menu changes. Double beds comfortable but small (4ft 6in). Some issues with wifi. On arrival, we were given a room that had not been made up / cleaned. The receptionist sent up a woman ( housekeeper) who showed us to another room that had not been cleaned out (This was circa 4.00.pm) On the third attempt and on a different floor, she found us a room that appeared to have set up for new guests. ON closer inspection, there was a layer of dust, stained carpets and no fan in the ensuite. After leaving our luggage, I adjourned to the bar only to be served a pint of Carlsberg, that was "off", the barperson apologised profusely, but could not rectify the problem. The meal that evening was close to inedible. I had a salmon darn, that might have fed a small child, my wife had roast pork while the serving was large the quality was poor. Vegetables were steamed /poor quality ( salad potatoes) over all, a very poor tourist menu! Breakfast the next morning, menu impressive, but the cooked Full Irish was hardly "full" : One sausage, One Rasher, One slice of Black Pudding ditto white, half a tomatoes nice portion of scrambled egg, choice of mushrooms/ beans/ recycled potatoes (salad) from the night before. Its a GOOD walk from the centre of Killarney ( a 6 Euro taxi fare) The best asset this Hotel has is it's front of house staff " They give a 5 star service in a 3 star hotel! we had a lovely break hotel staff were very helpful.food was exellant. we dined at the hotel on both nights.we had a very relaxing couple of days .we are back there again in october. Very nice hotel overlooking a river hence the name. Great value and great location within walking distance of Killarney Town. Would have no hesitation staying there again. Nice clean quiet room and very nice breakfast with great choice. Loses a star in my opinion as room we had was a ground floor room overlooking the car park when a more elevated room overlooking the river would have been appreciated, we had no reason to complain given the competitive room rate we got. Bed adequate but not the most comfortable I have spelt in. The hotel is beautiful. The room was spacious and spotless. The breakfasts were delicious as was the dinner. I would definitely stay there again!! The staff were very friendly,curtious and helpful. I have stopped in literally hundreds of hotels in many countries. The staff here were second to none, the food was way above expectations, the décor was perfect for me. The location for Killarney was perfect and I had a lovely view looking out over the river. I used the hotel for a mini break and the hotel was perfect for that need and in fact would be perfect for longer stays and business use. I would recommend this hotel to everybody without reservation. Our stay in the Riverside Hotel was a pleasant experience. From the moment we arrived we were made welcome. The rooms are comfortable and very clean, just a short distance from Killarney town centre and a stroll away from Killarney National Park. Our package included a 2 course evening meal which in the context of what we paid for the overall stay was excellent value. Breakfast is a feast offering everything from the traditional irish to fruit , cereals cheese etc. I would highly recommend the Riverside Hotel for a break and will certainly make a return visit. Nice hotel and really enjoyed our stay but the food was very poor. We had a meal in the restaurant one evening as part of the package and the pork was overcooked and inedible. Very disappointing. The hotel was lovely, really comfortable and the food was fab. All the staff were really nice and accommodating, and the hotel is located only minutes from the town. It was an excellent stay, will def be back! Enjoyed overnight stay in Riverside Hotel. Hotel is immaculate, friendly staff and comfortable room. Had meal in bar, only suggestion would be more chips less fish! Breakfast was good. Will return. Enjoyed our stay,have been many times would highly recommend. Food great,staff lovely. Great stay at the Riverside. Checked in early around 1230 and our room was ready. Room was spotless and spacious. Had lunch in the bar with afew drink nice atmosphere, food was excellent and service was first class from Christy. Staff were very helpful with local info and were very friendly. Overall was happy with our stay and would defenitly return to the Riverside. Lovely hotel, friendly staff, good breakfast & nice clean rooms. My only criticism would be that I found the set menu very limited for dinner as some of the dishes were very complicated/unusual, however the chocolate fondant was divine!! Very friendly staff, good food and nice rooms.